The arrival of Freeform Technology has created a revolution in lens personalisation. 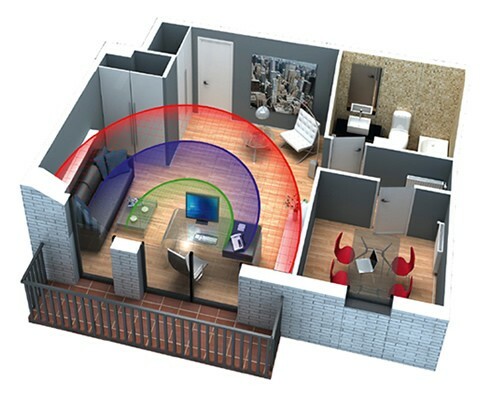 Our Exceed range represents a group of engineered designs that incorporate the latest technology. Each design under the name Exceed guarantees the most sophisticated possibilities of personalisation and optical performance. The new freeform generators are now so accurate they allow us to cut a nearly infinite number of surfaces with never seen before precision. Exceed PBC uses complex variable curves on both surfaces of the lens to provide excellent vision correction. 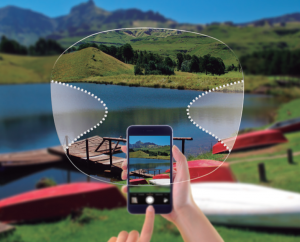 The unique, continuously changing surface curvature of the specially designed lens delivers an expanded reading zone and improved peripheral vision. 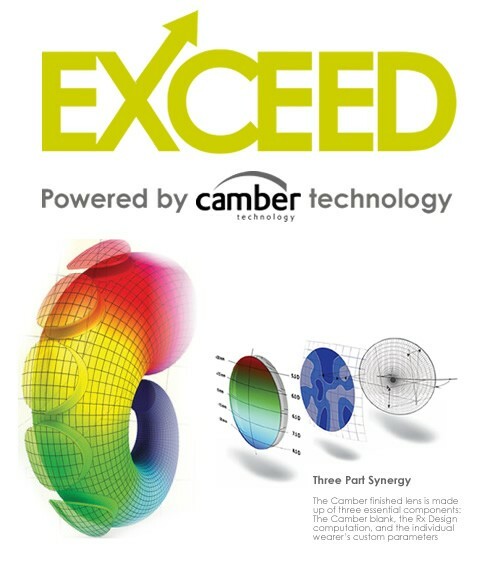 With our sophisticated Exceed inner surface design both surfaces work together to produce an expanded Rx range, better cosmetics (flatter for many prescriptions) and superior near vision performance, when compared with conventional progressives. The Camber Lens blank features a variable base curve – a new front surface innovation that provides the optically ideal base curve in all three viewing zones. From the top of the lens blank to the bottom the base curve increases up to three dioptres. This ‘stacking of the spheres’ is a totally new idea and unique to the Younger Camber semi-finished blank. Utilising this special blank a digital lens design on the back surface provides benefits to wearers in both the distance and near zones. Wearers enjoy noticeably increased acuity in the periphery of the distance zone, as well as a reading area that is more comfortable and easier to find in all adds up to 4.50. With Exceed lens design the camber blank is only the beginning. When this unique front surface is combined with a sophisticated back-side digital progressive design, both surfaces work together to achieve Exceed powered by Camber. The Design can be further enhanced by adding the individual frame values including pantascopic, face form angle with back vertex distance measurements. However if you choose not to give us these additional measurements we will use our set default values. An Advanced Digital Progressive Lens like no other Exceed powered by camber finished lenses give wearers an outstanding visual experience, with spacious reading zones, improved peripheral vision, an expanded Rx Range, better looking lenses in many materials, and patient-preferred near vision performance. A brand new addition to the Exceed range of digital progressives. This fully digitised inner surface progressive is aimed at the driving and general outdoor market. Ex-Drive benefits from enlarged distance and intermediate zones with only a minimal reduction in near reading area. Due to the specific focus on distance and intermediate dynamic vision the minimum fitting height is 17mm with no short corridor option. We would of course recommend adding additional measurements to include (BVD, Wrap, Panto) measurements for the best as worn solution to compliment this dynamic lifestyle lens. A modern super soft design full inner surface digital general wear progressive with a balanced combination of visual zones. To get the very best from this product we suggest that additional measurements including BVD, Wrap and Panto are added to your order to fine tune the final as worn prescription to compliment a dynamic lifestyle. Exceed is best suited to all emerging presbyopes as well as current digital progressive wearers or any patient wanting more expansive usable vision areas combined with all round increase in performance. This up to date digital inner surface progressive is an ideal product for first time wearers or any patient leading a more dynamic lifestyle. Low distortion in periphery produces increased fields of view in distance portion of the lens with soft power transition to near. Lens availability from 1.50 to 1.74, and a wide range of lens types including: CR39, Trivex, Polycarbonate, Transitions, XTRActive, NuPolar Polarised and Drivewear. Clear 1.50. 1.60 & 1.67 available with UV++. A lens with great benefits at a great price! Ideal for current and new progressive users looking for an economic solution. This is still a full digital inner surface progressive but with slightly harder design characteristics ideal for patients swapping out of a front surface traditional design PPL. Non-compensated design for general use with generous visual areas for near and far. Digital single vision atoroidal inner surface with enhanced cosmetics. Our Freeform Digital Single Vision lenses combine ergonomics and aesthetics with the best optical quality available today. Whether the frame is curved or has a high pantoscopic or wrap angle, if it is big or small, if the refractive index is high or low if you need to surface the patient’s prescription then think about upgrading to I-Focus. Each lens is unique: it is calculated for each wearer taking into account the prescription, pupil position and the 3D shape of the selected frame. Single vision has nothing to do with traditional convex aspheric lenses, with which only correct in the major meridians. The surface of an I-Focus single vision lens incorporates oblique aberration correction on a generic surface, as complex as that of a progressive lens. If you need a surfaced single vision lens due to higher power in sphere or cylinder I-Focus should be your first choice. The result is a lens that is easy to prescribe and easy to mount, which will fit the user perfectly from the moment they put them on. The Exceed PBC Mobile has been designed specifically for users of electronic devices, Camber Mobile incorporates Smart Add technology. This technology has allowed us to design wider near and intermediate fields with a smooth transition that allows wearers to change focus between different distances in a more agile more efficient way. Finally the unique progression profile slope makes it easier to find the near and intermediate zones. Provides superior dynamic vision with greater ability to focus on small details with smart add technology. Ideal for emerging presbyopes as well as more established wearers looking for dynamic vision particularly when using electronic devices. This outdoor specific varifocal benefits from extra wide distance and intermediate zones with a limited but usable near vision zone. Ideal for all extreme outdoor pursuits. 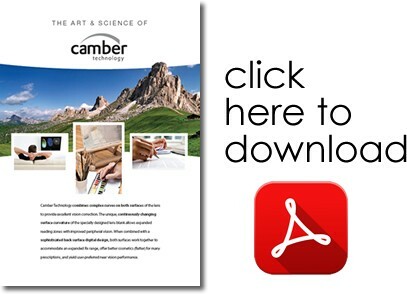 BVD, Wrap and Panto measurements essential when ordering this product for supply to all wrap design frames. Trivex, Polarised Mirror, Transitions, XTRActive and Drivewear. Office Vision is our digital freeform occupational lens for working environments. 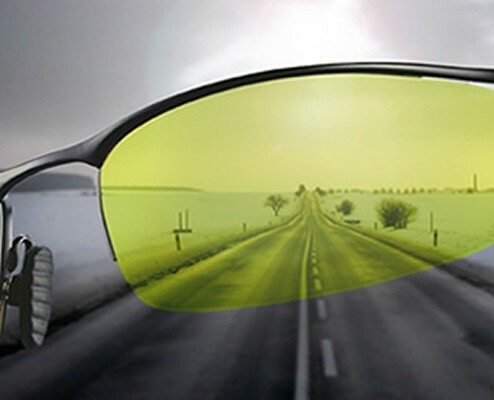 Designed to give clear and sharp vision for intermediate and near distances ensuring you have all day comfort. Office Vision is ideal for close proximity computer work owing to it’s extremely wide near vision area and allows you to view your surroundings or colleagues across a desk without any noticeable distortions. 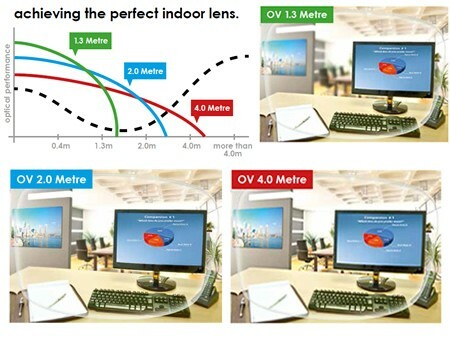 Office Vision is available with options to give the user a choice of three different clear vision depths. Adaptable clear vision depths provide the patient with a perfect visual solution adapted to their individual needs. Ask your representative for more information or just call your Customer Care Team who will be more than happy to help direct your enquiry.